A super easy and delicious high-protein gluten-free pizza crust made with 5 simple ingredients! household...as my little one gobbles it down in no time. It is incredibly quick & easy to throw together, tastes amazing, has a superb texture, and complements nearly any topping you can think of (and is even wonderful on its own)! Preheat oven to 400°F. Line a cookie sheet with parchment paper, set aside.Combine all of the above ingredients. Mix well.Using a spatula, spread the mixture onto your parchment lined cookie sheet. Use your spatula to flatten & shape mixture into a round or rectangle, about 1/2" thick.Bake for 20 minutes. Remove from oven & top with desired ingredients (*see below for toppings in images).Place back into the oven & broil pizza for 4 minutes, or until bubbling & beginning to brown.Remove & let cool for a few minutes before slicing & serving.Enjoy! 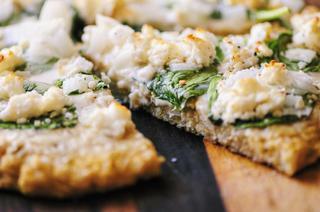 *Pizza as shown in the photos above was topped with ranch dressing, spinach, onion, garlic, cracked black pepper & feta cheese!